Reach for the stars, Lakshay Chaprana!!! 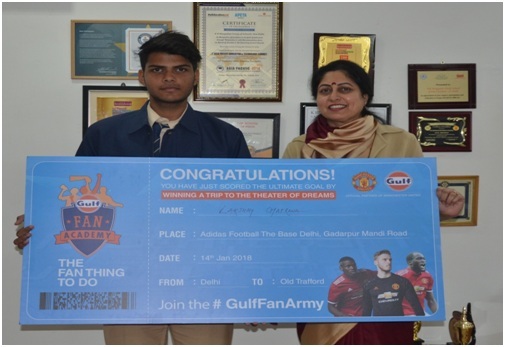 The students of KRM have always hit a home run by winning accolades at all levels and it is a matter of immense pride that Lakshay Chaprana of Class XI, of K.R Mangalam World School, G.K-II has been selected out of 15000 football players of Delhi to represent his school to visit Old Trafford , England to play for the Manchester United Team in March 2018. The Principal, Ms Alka Awasthi wishes him the very best for this endeavour.